I am quickly becoming a big fan of Lisa T. Bergren's work. I absolutely loved the River of Time series, and so far, it looks like I'm going to enjoy the Remnants series as much or more. 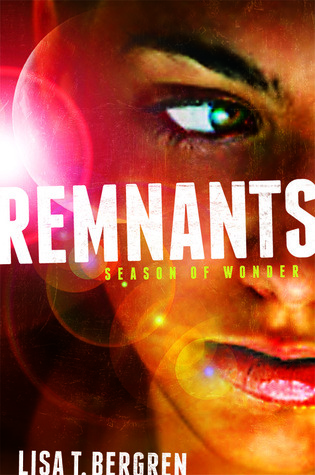 I got pulled into Remnants: Season of Wonder as soon as I read the first chapter or two. I think it took me a total of about four hours to read the whole thing. My favorite books are always the ones with well-developed characters, and I loved the two main characters, Andriana and Ronin. They felt very real to me. It's a difficult task to write characters who sound their age without sounding contrived, and I think the author did an excellent job with them. Not only did they feel real, but I also felt like the reader could learn a lot from all of the characters, not just the two main characters. They had courage in the face of danger, hope for a better future, persistence and loyalty to their beliefs even when other people questioned and persecuted them for it, just so many qualities that anyone, teenager and adult alike, can learn from and try to emulate. Another quality of a good book, in my opinion. I also thought she did an excellent job with the world she created. It's our world, but in a future that isn't what you would necessarily expect. But it's so believable. The world that Andriana and Ronin live in is not easy and they didn't grow up as teenagers today would and their characters reflect those differences well. But in a lot of ways, they're still just teenagers, which helps make the reader accept their world and their life without question. I never felt that there were holes in her descriptions of the world or like I questioned the believability of the world she created. I always take it as a good sign when I feel sad when I'm done reading a book because I won't get to read the next one for a long time. And I definitely felt that way when I got to the end of this one. I really can't wait to read the rest of the series and find out what happens. I think this series has the potential to become one of my favorites, one that I'll go back to and read again and again.